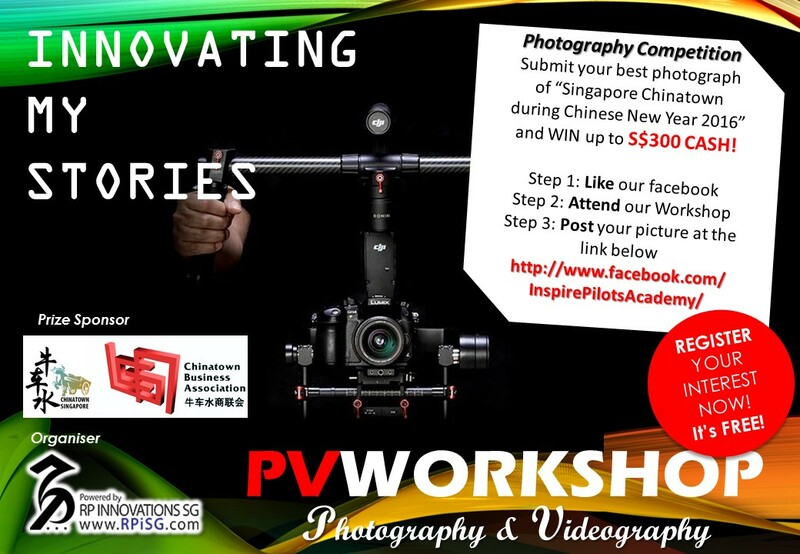 RP Innovations SG is proud to present this half day workshop on Photography and Videography. This workshop will cover the basics of photography and videography, cinematic techniques to build creativity in your stories and; tips and tricks for street and night photography. In addition, participants will learn to use the DJI OSMO during the practical session. Most importantly, participants will put their skills into practice in Chinatown and compete to WIN up to S$300 CASH. 1. Participant is required to complete the three steps to qualify for the competition. 2. All entries must be received by the stipulated closing date of 2 February 2016, 2359hrs. 3. Only workshop participant is allowed, and each participant is allowed to submit up to 2 photos. Only one photo will win the prize. 4. All entries will be judged by a panel selected by RP Innovations SG and all qualified winners will receive notification by 15 February 2016. 5. This competition is limited to 3 winners only. The prizes for First, second and third position will be S$300, S$200 and S$100 Cash respectively. 6. Prizes are non transferable. 7. RP Innovations SG reserves the rights to the final decision and no further correspondences will be entertained. 8. By taking part in this competition, you understand and accept without condition that RP Innovations SG and its sponsors may elect to use your photograph contained herein for internal and/or external marketing purposes in a manner they deems fit. 9. By taking part in this competition, you also consent to the collection, use and disclosure of your personal data for the purpose of contacting via electronic mail to inform you on promotional and marketing updates. REGISTER early to avoid disappointment as each workshop is limited to 30 participants. This workshop will be conducted on 30 Jan 2016 (Saturday) from 3pm to 10pm. Our training team will contact you in due course once you have registered your interest with us at http://www.inspirepilots.sg/events/innovating-my-stories/. Reservation is based on first come first served. Your slot will only be confirmed once we have verified your particulars. If you like to pre-order the OSMO from us @ $950, please indicate it in the remarks when you reserve a slot for the workshop. You will collect and pay for the OSMO during the workshop.